If your exercise bike doesn't have a computer that tells you the distance traveled in minutes, you'll need to use a little math to work it out. However, you will need to use a bike with a speedometer, or you won't have enough information to make the calculation. The basic principle is that distance is equal to speed multiplied by time, according to the BBC Bitesize education website. So if you have figures for both speed and time, you can work out the distance. 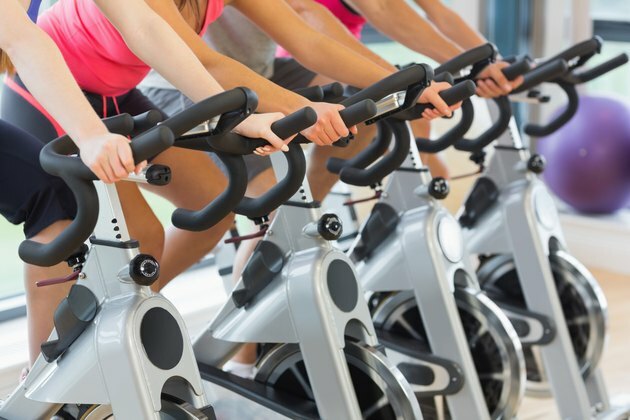 Start riding the exercise bike and reach your chosen speed. Check the speedometer and try to maintain a constant speed. This makes it easier to make an accurate calculation. If your speed varies too much, the distance covered changes. Read the speedometer. Ensure it shows speed in miles per hour (mph). Divide the miles per hour figure by 60 -- the number of minutes in an hour. For example, traveling at 15 mph, you would have a per-minute speed of 0.25 mph. Calculate the amount of minutes per mile figure by dividing 1 by your per-minute speed. For example, 0.25 miles per minute equals 1 divided by 0.25, or 4 minutes to travel one mile. Apply the same basic formula to any miles per hour figure you achieve on the exercise bike.